This article is part of a series here on Are Home Theater PCs Ready for Prime Time? There are several types of tuners for PCs. Some process old style analog signals, some process digital signals, and some encrypted digital cable signals. The latter requires a CableCARD, a small device that replaces the set top box. Where I live, Time Warner is changing many if not most channels to encrypted digital cable. That includes most of the high definition channels. So, for me, using a CableCARD tuner is the only acceptable choice. The digital tuner products below also function as video capture cards, allowing video to be recorded to the hard drive. That removes the video capture/compression load from the computer. However, video playback (and associated decrypting and decompression) is handled by the HTPC's on-board graphics or graphics card, so you still need a decent graphics processor in the computer. The graphics card in your computer will likely handle this task well. If you are heavy into gaming, though, you'll need to upgrade the graphics card (if the computer has a slot for this) and probably the computer's cooling system. All of the products listed below use a single CableCARD regardless of the number of built-in tuners. All CableCARD tuners have been certified by CableLabs. From personal experience I do not recommend the ATI TV Wonder card. The SilconDust HDHomeRun Prime requires that you have a home Ethernet network. This product includes three tuners. SiliconDust takes the unique approach of placing its HDHomeRun Prime at the router in your home network instead of in or connected to your HTPC. I like the way this reduces the amount of hardware that must find a place in the home entertainment center plus two fewer things to have to plug in there. Of course, on the rare occasions when you need to access the tuner box or tuning adapter, you'll have to go to a different location—not a big deal for me. You'll need a cable TV outlet near your router (or run a coax cable from an available outlet). With the HDHomeRun Prime, your family can watch and record TV from any Windows 7 computer with WMC on your home network without a Media Center Extender. I set up WMC on my laptop to try this out and was quickly watching TV on it, too. Simple. 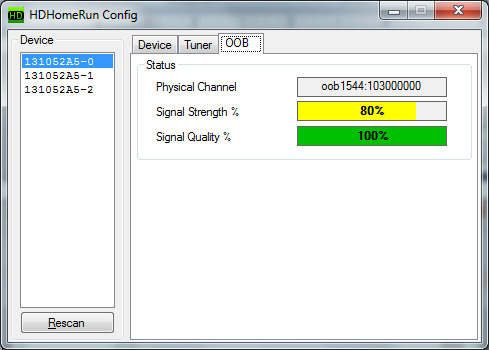 Sharing the available tuners is automatic (Ceton can also do this, but the tuners must be assigned to the PCs). The "Quick Start Guide" is professionally designed and is easy to follow. I disconnected the tuning adapter from my HTPC and moved it to my router. It was a simple matter to set up the HDHomeRun Prime and tuning adapter: Plug both into power. Connect coax from the cable TV outlet to the tuning adapter and connect the short coax provided by SiliconDust from the tuning adapter to the HDHomeRun Prime. Connect the provided USB cable between the tuning adapter and the HDHomeRun Prime. Connect the HDHomeRun to the router via the provided Ethernet cable. Plug the CableCARD into the HDHomeRun. And then install the software on the HTPC with the included CD. The software installation went like clockwork. It even looked online for a later version of the software and installed it instead of what was on the CD. I had already run the Digital Cable Advisor Tool on the HTPC so I didn't have to repeat that. Continuing to follow the clear instructions, I opened Windows Media Center and ran Tasks => Settings => TV => TV Signal => Set Up TV Signal. This allowed Windows Media Center to recognize the three new tuners. During this process, also per the instructions provided, I called Time Warner to activate the CableCARD that is now in the HDHomeRun. And just like that everything was working beautifully...except for one problem (which, as you will see, was not SiliconDust's fault). The switched digital channels would work for a few seconds and then stop with an error "Message from the TV service provider. Requested channel is temporarily unavailable." After a few seconds that message would be replaced with "No TV Signal. There is currently no TV signal detected for this channel. The channel may be temporarily off the air, or you may need to adjust or reconnect your TV antenna." This is where Barbara Jordan from Time Warner CableCARD Support came to the rescue again (she had already helped with a problem with the Hauppauge 2650). This time she found the cause of a problem that had eluded many TW cable techs for almost two years. She is very familiar with the SiliconDust HDHomeRun Prime and its diagnostic tools. She went through several diagnostic screens in HDHomeRun Setup andHDHomeRun Config. In the latter, on the OOB tab (Out of Band tuner), she noted that signal strength must be at least 85% and preferably above 90%. You can see from this screenshot that mine was getting only 80%. It took awhile for the TW service techs to be convinced that this diagnostic information was meaningful because their own tools reported this was not a problem. Finally an amplifier was added at my home, OOB signal strength rose to 94%, and now all seems to be working perfectly. Just to make sure my Internet is still ok I did speed and ping tests and all is well. After all this time and grief... Hurray! So now I have the three CableCARD tuners from SiliconDust plus two digital tuners from Hauppauge (WinTV-HVR-2250 for channels that are not switched digital or high def). I am now able to record five programs at once or watch one while recording four others, and three of those can now be encrypted high def. I am spoiled to high definition TV. It is really hard to watch programs in standard def now. I am very impressed with the SiliconDust HDHomeRun Prime product. It was very easy to set up and it just works. Low friction, just the way I like it. I highly recommend this product. January 28, 2012: I've been using the HDHomeRun now for a couple of months and it has been very reliable. Run the Windows Digital Cable Advisor to make sure your PC is compatible with the WinTV-DCR-2650. Plug the WinTV-DCR-2650 into your PC via the USB cable. Plug in the power to WinTV-DCR-2650. Install the Windows driver and software from the WinTV-DCR-2650 CD-ROM. Connect cable TV. Insert the cable card you received from your cable operator into the back of WinTV-DCR-2650. Setup Windows Media Center for Cable TV. Call your cable TV company to activate your cable card. In the instructions on page 6 of the installation guide it says Note: the label on the cable card should face up. If you plug the cable card in upside down, the green Cable light on the front of WinTV-DCR-2650 will not light. I now know that at least some CableCARDS have labels on both sides. Crouched behind the TV in a poorly lit area and seeing a label on the side of the CableCARD facing me, I assumed it was the side to face up. After going through the Windows Media Center TV tuner setup twice, I pulled the card and realized that the main label was on the other side. After I inserted the card correctly (and both lights then came on which I should have checked earlier), WMC's "Setup TV Signal" wizard successfully prompted for the host ID and the tuner setup proceeded successfully. Fortunately, a very patient Barbara Jordan from Time Warner CableCARD Support helped me through this process and even showed me how to get to the diagnostic tools as she verified that all of my equipment was working correctly with their service and equipment. I ran into a tuning adapter compatibility hitch which prevents access to switched digital channels. Ken at Hauppauge support directed me to their website to get a more recent driver and firmware. No joy. The Hauppauge Tuning Adapter service was not successfully installed. The next day Jerry Fox gave me access to another firmware update which did successfully install their tuning adapter service and the Hauppauge WinTV-DCR-2650 started working fully. Unfortunately, it did not last. When we returned later to watch TV, any SDV channel gave the error "Viewing or Listening Conflict, No tuner available to satisfy the current request." So I power cycled the 2650, the tuning adapter, and the PC and it started working again...for a while. Then the same error. Later I got a report from Ken that they had zeroed in on a timing problem in the driver. Several days later this problem was reported to be fixed. I downloaded and installed the new driver but was still experiencing the problem. It turned out to be an issue on my end, but I was not able to figure that out until I started testing SiliconDust's HDHomeRun Prime and had access to their diagnostic tools. See my comments above for the HDHomeRun Prime. Now that that issue has been fixed by Time Warner, I think the 2650 will work fine. I will verify it as soon as I can and will then update this article accordingly. Both have four tuners and are functionally the same. Ceton provides a free Network Tuners application that enables "individual tuners on a Ceton InfiniTV to be assigned to additional PCs, bringing live, premium, high-definition cable TV to multiple Windows 7 PCs in the home." I will be interested in comparing this with the similar capability of the SiliconDust HDHomeRun Prime product, especially to learn from a user's perspective what it means to "assign" other PCs to a tuner vs. the HDHomeRun approach that does not require an assignment. The Ceton InfiniTV 4 Digital Cable Quad-tuner Card (internal card) is a low-profile PCIe card that also includes a full height backplate. I received the InfiniTV 4 Digital Cable Quad-tuner Card and installed it after removing the other tuners. I am very impressed with the quality of their card's construction and the easy-to-follow installation and setup instructions. Everything went very smoothly. The first thing my son did, though, was to add protection to the relatively fragile pigtail that adapts the coax cable to a smaller plug. Ceton included special instructions about avoiding excess bending stress when installing the pigtail. So before we installed it, my son cut a plastic straw in two small sections and taped them to each end point. After installation and configuration I turned on the HTPC and started tuning into channels. Everything worked perfectly. I started recording four high def digital channels that use SDV and it worked perfectly. Then I tried to open a fifth station to make sure WMC would still display its friendly failure message. And...aaargh...the computer froze. Completely locked. I had to do a cold boot—which I really hate doing since this frequently fouls up the system files and requires a complete reformat and reinstall (or restoring a backup image). As it turns out, my computer was about to experience a host of cold boots. For the next few days I was able to use the computer and watch Internet TV. I could even successfully record the occasional show in WMC. But using WMC, recording a show or now, it would eventually lock up. Things deteriorated to the point that tuning in with WMC even for a few minutes would cause it to freeze. Throughout this process I was in communication with Ceton tech support. We tried many things, but none worked. We concluded that either the card was bad or something in my computer was causing a conflict. Finally, I bit the bullet and took a couple of days to reformat and reinstall and reconfigure everything. I really wish WMC would allow all of its settings to be exported and restored. Most of this time was spent getting image backups at different stages so I'd be able to do a faster restore the next time. It also took a long time to get through the gazillion Windows 7 updates. Then I reinstalled the Ceton software and tried again. I did this before installing any of my other utilities, not even installing Microsoft Securities Essentials (anti-virus) so that I could ensure the the degree possible that there was nothing on this Windows installation that would conflict with the Ceton card. And, indeed, once again the Ceton started working again. Hopes were high. Then the screen froze. Double aaargh! It gives the wrong address to the installer software. You can get to it (as of the date of this publication) by going to Ceton.com, open the drop-down support menu, and select "Installation and Downloads) to install "Ceton InfiniTV Installer for Windows 7". There was no mention of a tuning adapter. If your digital cable TV service requires a tuning adapter to receive switched digital channels, you'll have to make sure it is included correctly in your tuner setup. I ran the cable TV coax into the input port of the tuning adapter, the output coax into the Ceton, and the USB cable for both the tuning adapter and the Ceton to available USB ports on the home theater PC. I had to find space in my entertainment center for the tuning adapter and the Ceton when I switched from the SiliconDust HDHomeRun Prime (which is placed at the home network router), making sure there won't be any equipment overheating from blocking vents. Still, I am very pleased with how smoothly the process went for the USB model and I am delighted that it is working smoothly. I'll let you know if I run into any problems over time and I'll also test Ceton's solution for sharing tuners by assignment. February 11, 2012: Problem. Occasionally I hear the audio feedback indicating that a USB device has deactivated, and then shortly after that it has reactivated. It is the Ceton box. Over the few weeks since I installed this device, I have had several failed program recordings and partial recordings. I've been advised by Ceton support to do a diagnostic capture for them. It could turn out to be some problem on my end. Are three tuners sufficient (lower cost)? Do you need four tuners (higher cost)? Do you want the tuner box (and tuning adapter if required by your cable company) to be placed at the same location as your HTPC or at your router? If you want to watch TV on multiple PCs in your home, then another consideration will be whether automatic tuner allocation vs. assigned tuner allocation is best. I will update this report when I determine what is causing the problem with my Ceton device.